Roxy the American Bull Dogue de Bordeaux at 1 year old—"Roxy it the most fun loving, Kind Bulldozer you could meet. I've recently had a baby and she's fantastic with her. She weighs a whopping 88 pounds (40kg). She's gentle loves playing with other dogs, but is also a lot more protective since I've had baby. She loves cuddles in bed. We've recently got another dog as she does like to destroy the house when we leave, so got a companion for her and so far it's worked. She is recovering from surgery as she snapped her crutiot ligament but it's been 2 months now and she's doing well. She looks different than most of the dogs I've seen on this website so that's why I thought I would share her pictures." The American Bull Dogue de Bordeaux is not a purebred dog. 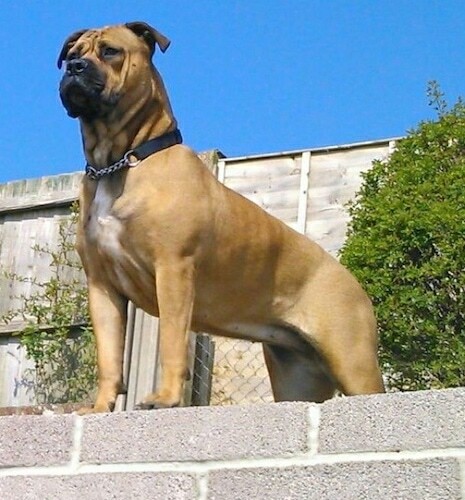 It is a cross between the American Bulldog and the Dogue de Bordeaux. The best way to determine the temperament of a mixed breed is to look up all breeds in the cross and know you can get any combination of any of the characteristics found in either breed. Not all of these designer hybrid dogs being bred are 50% purebred to 50% purebred. It is very common for breeders to breed multi-generation crosses.